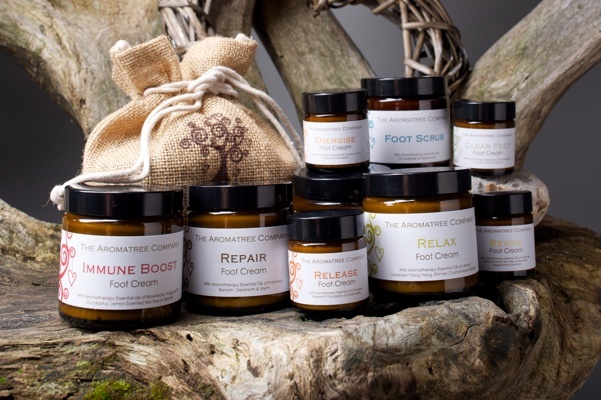 At the Aromatree Company we welcome enquiries from businesses who wish to stock our products for resale or therapists who wish to use our range of foot creams in their treatments. In addition to the 30ml and 120ml we have the 500ml size available for your therapies (not for resale). Please email us and we can let you know more details. Our foot creams are a therapy in themselves and can be used by therapists after a consultation to decide on the appropriate cream for their client. They are particularly useful if you are not a qualified Aromatherapist but would like to offer another dimension to your treatment. We have found that they are a great medium to use for Reflexology, Foot Massage or Holistic Pedicures as it does not absorb too quickly yet is not too greasy and does not go ‘grainy’ after working with it! Please email us at info@thearomatreecompany.com or call on 07906 968422 for more information.